Jon Danzig's World: Isn't it time politics grew up? 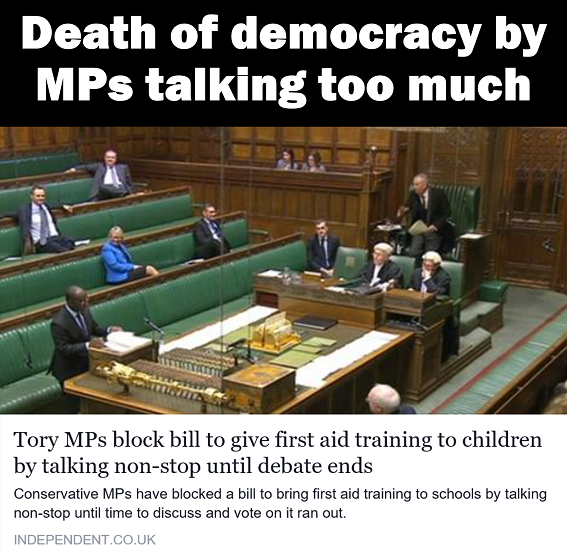 A bill to introduce compulsory first aid training for all school children was blocked when Tory MPs purposely talked for so long that the proposal ran out of Parliamentary time. The Emergency First Aid Education Bill would require all state-funded secondary schools to teach first aid to children as part of the national curriculum. But a group of naughty Conservative MPs on Friday plotted to talk-out the bill, a process known as filibustering. Subsequently the idea (a good one in my view) to teach children the essentials of first aid was killed-off before it had a chance. The bill had the backing of St John Ambulance, the British Red Cross, and the British Heart Foundation and several other charities. According to a poll organised by the charities, 95% of parents agree that first aid should be taught in all secondary schools. Over 14,000 parents wrote to their MPs calling for the bill to be passed by Parliament. Commented the Red Cross, "We have been campaigning for years to get first aid on to the curriculum. We think everybody should know how to save a life. And unsurprisingly, students themselves – a whopping 91 per cent of them – would relish the opportunity to learn life-saving skills." St John Ambulance added that the proposed Bill, "would require secondary schools to give young people the skills and confidence to deal with a range of medical emergencies including cardiac arrests, heart attacks, choking, bleeding, asthma attacks, and seizures. Importantly, emergency first aid education ensures that pupils know to seek help and support when needed, including from the emergency services." But a small group of Conservative MPs literally (and purposefully) talked the Bill to its death. Tory MP Philip Davies gave the longest speech lasting for almost an hour. He said, “The title gives away the principle of this bill: compulsory emergency first aid education in state-funded secondary schools. He then went on to give a list of reasons why the bill should be rejected, saying for example that he had been taught first aid at school but had forgotten all about it. The government, he added, should not expect teachers to take on a “pseudo-parenting” role. He added that he did not want, “the Government to be sticking their nose in at every turn trying to lecture [teachers] every five minutes that they should be doing this, that, and the other”. Then other Conservative MPs continued to talk for as long as they could, simply so that the proposal would be wounded beyond any possibility of resuscitation. Conservative education minister Sam Gyimah read a long list of subjects that the deputy speaker described was like reading out-loud a ‘telephone book’. Despite being asked to stop, Mr Gyimah went on, and on, and on..
“I’d like to think that given that this is a matter of life and death my honourable friend might just allow this to have a second reading and then allow it to be dissected in a committee stage,” Mr Gale said. St John Ambulance told the Independent newspaper, “We’re frustrated at today’s result as we believe that the opportunity to learn first aid shouldn’t be left up to chance.” The British Red Cross said the outcome was “disappointing”. The Independent further reported, “The incident follows outrage over Mr Davies filibustering a bill to scrap hospital car parking charges for carers, and an incident where Government health ministers deliberately blocked a bill to promote cheaper off-patent drugs in the NHS. So far it has almost 24,000 signatures. I’ve signed the petition and would like to encourage my readers here to consider signing it too. If the petition achieves 100,000 signatures, the issue will be considered for debate in Parliament. What sort of democracy do we have when good ideas can be prematurely jettisoned simply by MPs talking for as long as they can, not to take part in debate, but simply to kill all debate? No wonder so many people feel completely disillusioned with politics and politicians, and no wonder so many young people can’t see the point in voting. The way some MPs behave in Parliament is a disgrace to the concept of democracy. My sister, Greta, used to say to me, “Jon, you have two ears and one mouth, and you should use them in that proportion.” Isn’t it about time our Members of Parliament learnt that lesson too?